The end of the vegetable gardening season is fast upon us. Summing up for the season the beans were very prolific. The tomatoes and pepper.... not so. The vine crops now being harvested were the best. I purchased all the seeds for the various vine crops from Seed Savers exchange located near Decorah, Iowa. What fun it has been to, in effect, go back in time, by planting things from our ancestors. The highlight of the fall has been Potimarron squash, the famous winter squash from France. 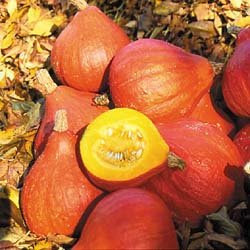 The name is derived from potiron (pumpkin) and marron (chestnut). Very aromatic and chestnut-like in taste. One of the very best for baking and roasting. Nice-sized 3-4 pound fruits store well. 85-95 days. My favorite squash for years has been Waltham butternut. Potimarron is every bit as smooth (nonstringy) and perhaps even more flavorfull. 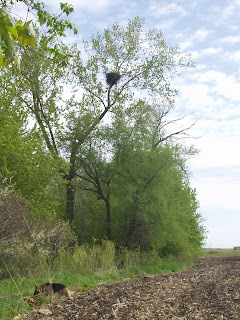 There are hundreds of eagles that nest along the Big River. The counties that border the river in Minnesota, Wisconsin, Iowa, Illinois and on south see a huge influx in the fall as migrants come into the area from Canada. 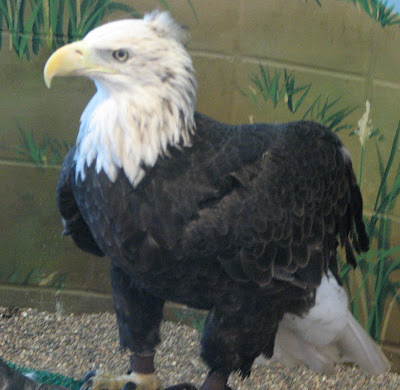 Mrs. Troutbirder and myself visited the National Eagle Center in Wabasha Minnesota several times. 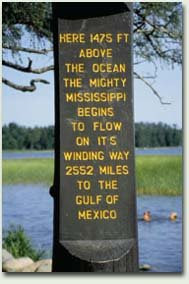 From there you can watch eagles flying up and down the Mighty Mississippi. 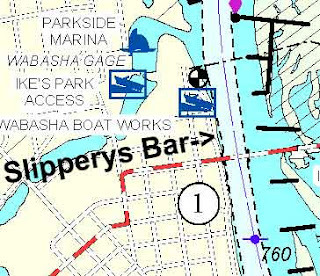 We often stop and watch them at the bar and grill made famous in the movie "Grumpy Old Men." Here are a hundred or more resident eagles visiting a chicken farm a few miles from the river in Wisconsin. We live 60 miles from the river. We saw an occasional summer visitor but, surprisingly, only in recent decades have they begun to nest here. 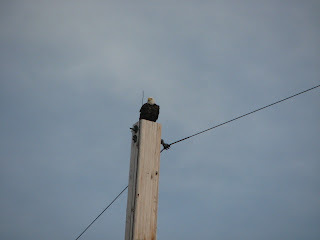 Now we have our own resident eagle family nesting only a few blocks from our home in the woods. They have found a haven in a large cottonwood tree, inside the fenced in trout farm. I watch them go about their business. I worried once when I mistakenly thought the nest had been destroyed this spring in a violent thunderstorm. I watched them feed on a deer carcass along the shoulder of a busy state highway and worried the trucks were too close. I saw an adult and a immature eagle rest within a few feet of my property in a soybean field. I saw one perched on top of a telephone poll nearby this week. One day this spring an adult hurried down the tree-lined road in front of my house carrying a large pine bough toward the ponds. It’s almost as if they are family now. I love "my" eagles. 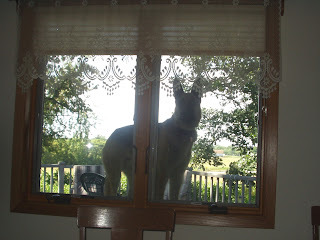 So what exactly is Baron doing standing on the table, on the deck, outside the dinning room window? Why is he moaning piteously, looking extremely depressed and tilting his head as if to say, "I don't understand." He wants to get in the house... of course! Then why in the world has this sweet, gentle, lovable, almost two, giant, overgrown goofus been banned from coming in since this spring." BECAUSE ACCORDING TO MRS TROUTBIRDER HE SHEDS LIKE CRAZY. Sadly it's true. All my previous hunting dogs (Chessapeakes and Labs) had short tight hair. Mr. Baron has a very thick short undercoat and long silky guardhairs which keep him warm in his kennel, in the garage, all winter. But come spring and it sheds off him in clouds. You can actually see it flying off when he runs about. Now he is not exactly being deprived. We have an "invisible" fence so he has the run of over an acre outside. 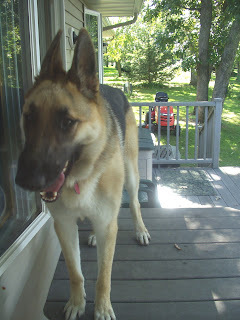 Then he gets to go along on most of my adventures and misadventures, hiking, biking and swimming. Also he is my ace assistant on all yard and gardening projects. Still, whenever I sit down to eat at the dinning room table, I have this feeling I'm being watched. I look back over my shoulder and....... good grief its Baron. 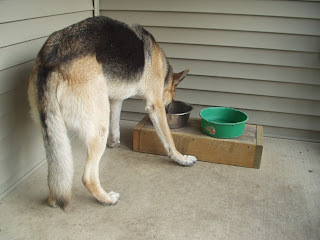 For now he has to eat on the front porch. " Winter is coming boy. Then you get to come in the kitchen, maybe even the living room when the new wood floor is installed. Things are looking up boy! 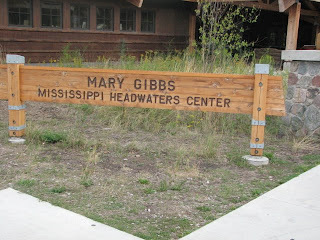 Buildings are usually named for people who have had long careers, but the new Mary Gibbs Mississippi Headwaters Center at Itasca State Park celebrates a brave young woman whose tenure at Itasca, although brief, had a significant impact on the park. 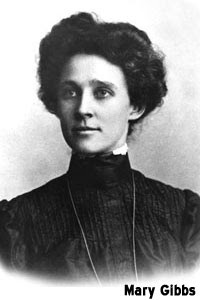 In 1903, at age 24, Mary Gibbs was appointed park commissioner (manager) at Itasca following the death of her father who was manager at the time. She served as commissioner for just three months in 1903, but what a tumultuous three months they were. 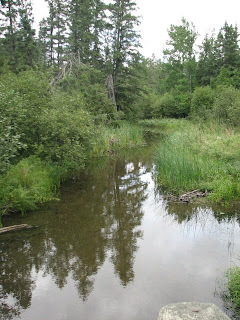 Mary loved the park and the river that ran through it-that tiny trickle that emerges from Lake Itasca as the Mississippi River and begins its meandering 2,552-mile journey to the Gulf of Mexico. Young Miss Gibbs felt it was her duty to keep the river flowing freely and the park pristine. When those core tenets were challenged, sparks flew, but the young park manager stood her ground. 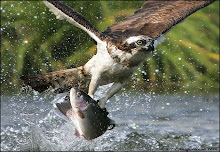 The saga of her daring stand against the powerful logging interests is one of the main focal points of the new center. To keep a logging company’s dam from flooding the lakeshore and killing the magnificent pine forest, Mary stared down the company foreman who threatened her at gunpoint. Mary eventually got her way. The logging company gave in, opened the dam, and lowered the water level. Thanks to her actions, the tall pines and lakeshore were saved. After she left Itasca, she spent the next 80 years of her life in Canada. Although Mary never saw the park again, she never forgot it. Mary may not have forgotten the park, but her own story was nearly forgotten until 1991 when folksinger Charlie Maguire was commissioned to write songs about the history of Itasca State Park for its Centennial Celebration. His diligent research for information to use for a song about Gibbs led him to Mary’s family. 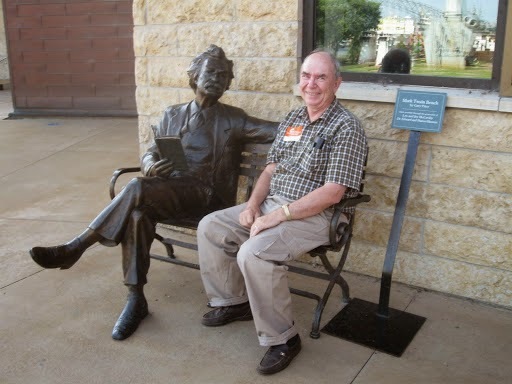 Maguire spoke with Mary’s son who told him that she treasured two books, the Bible and a book about Itasca written in 1904 by the park’s first commissioner, Jacob V. Brower. Maguire also discovered an album of photos Mary had taken during her time in the park. They provide a priceless record of life at Itasca at the turn of the Twentieth Century and have been reproduced for inclusion in displays throughout the Center. Maguire’s research also helped him determine that Mary was the first woman in North America, and possibly the world, to manage a comparable park. "I have carried the torch for Mary for almost 14 years," he said, "and I was constantly revising the song to include new information." The song was part of the dedication ceremony on Saturday, Sept.10, and Maguire gave a concert at the Jacob V. Brower Visitor Center that evening. In September, part of the park’s story came full circle when the descendants of Mary Gibbs came to Itasca for the dedication of the Center. 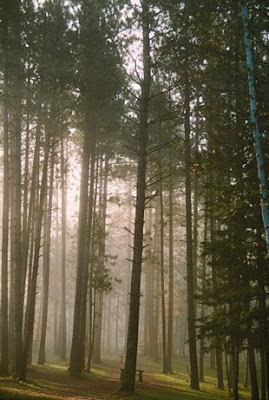 Itasca State Park is, perhaps, the crown jewel of Minnesota's many fine state parks. The survival of many of its magnificent Norway Pines can be attributed in no small measure to the courage of one young woman - Mary Gibbs. The first time I saw this sign was 1954. I was camping with my parents and brothers at Itasca State Park in northern Minnesota. Like most visitors, we jumped across the rocks, thus leaping over the mighty Mississippi. We visited that place again last week with our friends Gary and Rosie. The roads into the Park are lined with majestic Norway (Red) pines. These are survivors from the era of unrestrained logging that took place throughout the north country in the late nineteenth century. Itasca was our first state park. 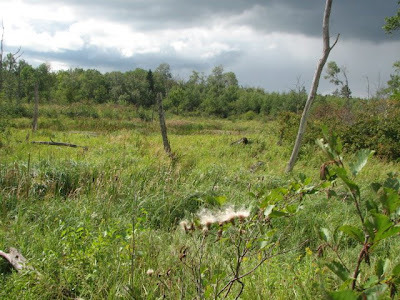 It was created, after much ado, as a gift to future generations, to show what our beautiful pristine northern forests looked like before being converted into lumber. Here "Preachers Grove" reminds of that primeval forest. 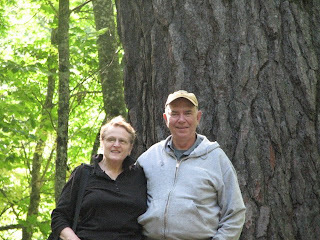 We took several hikes throughout the area. 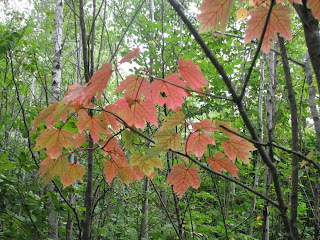 Fall was just beginning to make its appearance on the leaves. There was a crispness in the air which made everything seem sharper to the senses. 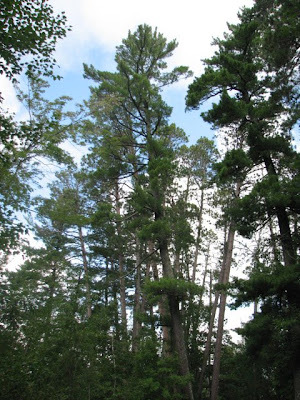 A blowdown had occured several years before as a result of the massive storm that did so much destruction in the BWCAW. Now regrowth made some of the trails seems claustrophobic as we picked our way through the damaged area. 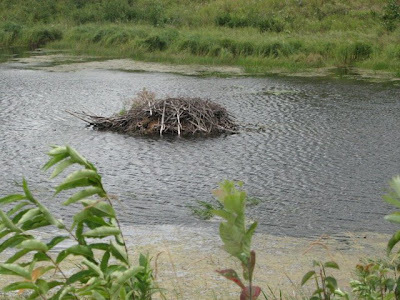 A small opening and pond was the home of a beaver family . 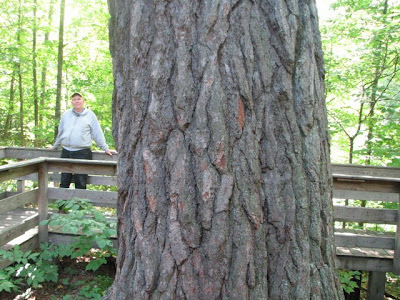 We also saw the largest white pine in the park and a red pine which shared with a similar tree in Michigan the honor of being the largest of its kind in the United States. From this beautiful setting, The Father of Waters, third largest river in the world, drains half a continent on its way to the sea.